an adult delivered some guidance with too much force, too little care, or simply passed on their own negative beliefs without even being aware of them. When we sit down to write, that inner critic can transform into an inner demon: a critic so vicious that we simply cannot get a word written. As soon as we put down a word, the inner demon is there to taunt us, and we hastily scratch our pen through our words or delete them from our laptops or iPads completely. And we are back to the empty page. A two-year-old could write better than you. If your clients see that, they will sack you on the spot. Is that what you call original? Our goal as writers is to make sure the inner critic does not overpower us and bring our writing to a halt. If we think of our writing as a sculpture, words are the clay. We need to get something down on the page in order to shape it, refine it and improve it. Many writing teachers will tell you to silence the inner voice and suggest ways to do it. Writing in the Huffington Post, coach and author Marcia Sirota likens the inner critic to an abusive partner and advises us to get rid of it. I’m not convinced. Certainly, we don’t want the inner critic to abuse us or paralyse us. But I believe the inner critic can actually be the voice of our reader, asking valid questions about the reliability of what we are writing. 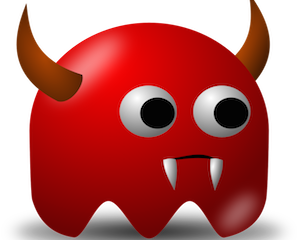 It’s a daring strategy, but can we harness our inner demon to help us identify what is good and what is bad in our writing. How can we safely to bring the inner critic into the writing process? The inner critic is not such a bad ol’ fellow – she (or he) just takes herself a little too seriously and is way too eager to get involved. The inner critic wants to slow everything down. One of the easier ways to put her in her place is to outrun her when you are writing your first draft. By this I mean just write quite quickly without stopping. If you are typing, no deleting. If you are handwriting, no crossing out. Just keep going. Promise your inner critic that, once you come to the end of your first draft, you will give her a little more involvement in the writing process. The inner critic is a bit like Shakespeare’s shrew (The Taming of the Shrew.) She’s sparky, witty and wild. We want to harness her energy but not let her run the show. But you can sometimes give her the floor. Write whatever she tells you to write. When you write down a sentence and the inner critic tells you it’s crap – write that down. For example: “Ok, that is actually crap, and I sometimes feel I cannot write a word that is not crap.” Then move on to the next sentence. It’s a little cumbersome, but at least you can keep moving forward. Later, you might edit her out. But not always – see below. Once you have finished the first draft, you are ready to apply some critical faculties to your work. This is the time that the inner critic can be helpful. If you have made notes of her nasty comments as you were writing, have a read before you delete everything she says. She might have a point. Perhaps she is saying exactly what a sceptical reader might think when they read your work. And so I might include that very comment in this blog (which I have in a nifty little way) and answer it. My answer would be that it’s better to write something and then edit it than not to write at all. It is also better to stand up from the desk with words on the paper – even if they are nasty words – rather than no words. And my final answer would be that when we write down what the inner critic says, without taking her too seriously, her words can end up in our story and make it better. One of my clients recently read me an entertaining dialogue between him and his inner critic. It was a beautifully written because it was entirely authentic and true. He discovered much about himself, his writing and the purpose of his work as he wrote. It is worth having a dialogue with your inner voice but only if you write it down. There is absolutely no point in arguing with the inner voice in your head; the result of that is that you get nothing done. And insist that she improves her manners. Our inner critics tend to be rude and insulting. If that is the case, don’t listen. Just say, ‘Talk to the hand, inner demon!’ until she can say something constructive. Don’t dialogue with the inner critic too often. The inner voice grows very big and hairy if we give her too much oxygen. We are putting her in her place, not giving her a job as CEO. Your inner demon wants to be a star. Give her a role, but put her in the chorus. She wants to have the floor all the time; she needs to know when it’s her turn to speak. She wants to be rude. Don’t let her be. Give your inner voice a role. Her role is to come in after the first draft and help you to see your writing as others would perceive it. Invite her in when she can help, and let her know when she is not needed.